The Farmer’s Dog is a company focused on delivering freshly cooked, human-grade dog food. 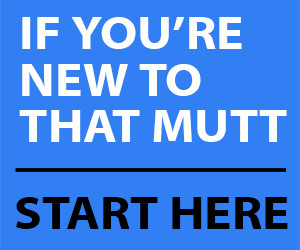 On their website you just answer some questions and they create a custom meal plan specifically for your dog. All meals arrive pre-portioned and ready to serve. You receive perfectly timed shipments to ensure you never run out of food and you can adjust or cancel your plan at any time. This post is sponsored by The Farmer’s Dog. 1. Most dog owners want to feed the highest-quality food they can afford without having to cook it themselves. 2. It’s a pain to go out and buy huge bags of dry food every month, haul them inside and store them. 3. More and more dog owners are skeptical of dry/processed kibble but they’re not comfortable or interested in feeding raw dog food. Fresh, homecooked food is a good alternative. 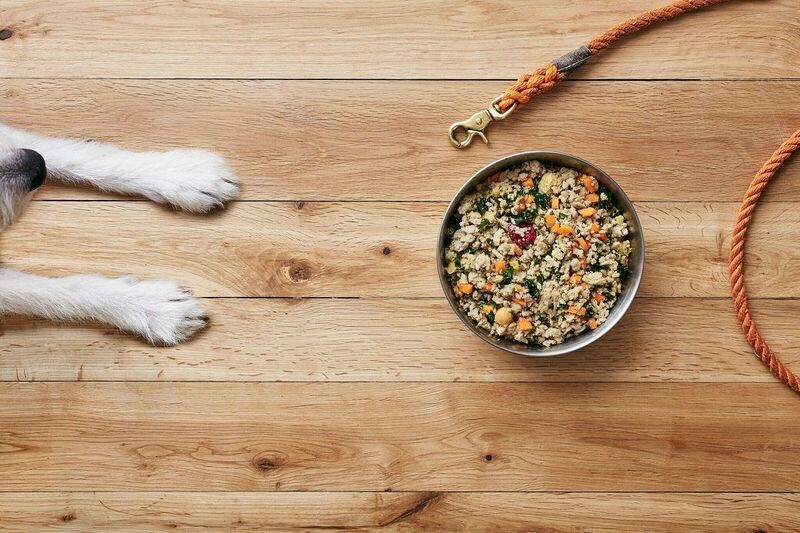 The Farmer’s Dog cooks fresh food for your dog and delivers to your home. It’s made with USDA human grade ingredients and pre-portioned out for your dog according to weight, breed, activity level, etc. It’s healthy and it’s convenient. Not surprisingly, this type of dog food does cost more than kibble, which is to be expected given that it’s made with high-quality, human-grade ingredients and delivered fresh on dry ice. I found that it’s similar in price to many of the raw dog food brands I’ve purchased. What is the cost of The Farmer’s Dog? The cost varies depending on the size of your dog, or course. It can start at as little as $11 per week. If this sounds too expensive, you can reach out to their customer service team with your budget and they’ll try to work with you! To give you an example, the cost to feed my 68-pound Lab mix The Farmer’s Dog for one week is about $60. The first time you order, The Farmer’s Dog will send you two weeks’ worth of food for the price of one and FREE shipping. This is designed so you can see the benefits and make sure the food is right for your dog. Then you would set up your own delivery schedule so you never run out of food. If you’re curious on the details of the exact cost for your dog, it’s easiest if you fill out a quick profile HERE so you can see a sample meal plan for your dog’s needs and the cost. What’s unique about The Farmer’s Dog? The Farmer’s Dog is unique because it delivers fresh, cooked dog food right to your door that is personalized for your dog’s nutritional profile. When you fill out your dog’s profile, you’ll be asked about age, size, activity, breed, allergies, any health concerns and more. The food is made without any preservatives and is delivered on dry ice. Ingredients are human grade, and the company ships directly to customers. Also, if you’re on a budget the company will work with customers on options so they can mix fresh food in with their dogs’ current food or use as a topper. Food is fresh and delivered right to your door! The meals are tailored to your dog’s needs. You fill out a profile for your dog & can adjust as needed. For example, we figured out Ace’s portions were likely too high in calories so after two weeks we could decrease the portions for the next delivery. I thought the food had too many veggies/fiber compared to the meat/protein. I have a lean dog who needs a lot of calories, fat and protein. I would recommend this food for someone who is interested in feeding their dog high-quality fresh food without having to cook the food or go out and buy the ingredients. If you do not have a significant budget to spend on dog food, this may not be the best choice at this time. It’s convenient that meals are automatically shipped to your door at your convenience (delivered on dry ice). It’s a nice option for someone looking for a more natural diet for their dog but who is not necessarily interested in feeding raw dog food. Would your dog like to try food from The Farmer’s Dog? I love your blog, the tips are so helpful in training my dogs. Thanks. I’d love to try your dog food. I am forever giving my dog fresh veggies and fruits. My friends think it’s crazy that my dog loves bananas and oranges. Love your blog and very interested in this food !what do you think of honest kitchen food ? Yes, THK is another good option. I would love to try this food for my dog! I use raw and fresh food as toppers to get my picky eater to eat! Would love to have my Golden try thes. I would love to feed my dog Josie a healthier choice of foods and am on the fence with a raw diet. Think this would be a great alternative. I’ve started doing research on healthy alternative dog food, and it’s a little overwhelming. It would be great to try a middle ground first to see how my girls would like the alternatives. Arlo (@arlostindt) would LOVE to try this food. 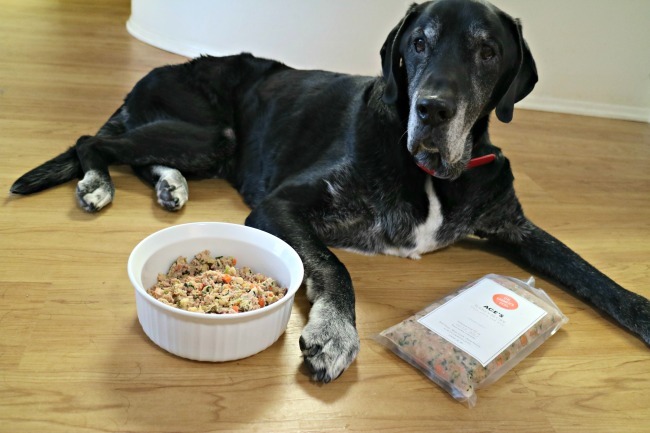 He is currently an Orijen dog and we really see the health benefit of high quality ingredients so this fresh option could be an awesome alternative to dry food! So this food is cooked? Yes, this is a cooked food. I am a proud owner of a Blue Dane/Cane Corso. I am always trying to find him the best foods to give him as he has a very sensitive digestive tract. I would love to try him on this food!! Hopefully I will finally find a dog food that is compatible with his system. i am very interested in this product, however, i tried to look at their website and you cant unless you register. i wanted to read abt their ingredients. i cook fresh foods for my girls, the, veggies, etc and use kibble and raw venison or turkey. i would love to try this food. i do find it more expensive than others, however, the trial seems like a good deal. it might be too much for me with 3 girls to feed though. however, i never skimp on food for my girls, if they like it and i like the ingredients i will buy it. thank you, my girls would love to try it. Yes, you need to fill out a profile to see the ingredients because it’s personalized for each dog. 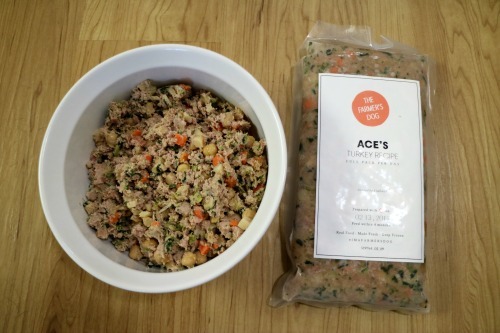 Ace’s recipes include turkey or beef and several kinds of veggies. Good luck in the giveaway! Wow. Meemer would love to try this. I would love to try this food for my dog! She’s is picky eater so this would definitely be a good choice for her. My Labrador Retriever would love to try this! Sounds like really great food. Our 10 month old Airedale is finicky but this sounds like a real find ! Izzy would love to try this. We rescued her last summer and are still trying to find food that is health that she also wants to eat regularly. I love your blog. My dog also has a sensitive stomach and cannot tolerate grains or lactose. Colby & Fritzel would love this! Kado would love this. He is always begging for our food at dinner time. He has never been fond of dog food ad we have tried almost every kind. Ally has always had problems with dog food. I would love to try this with her. Maybe she will like it. I would love to treat Jennie to some real cooked food. She’s 14 and getting kind of picky with what she will eat. Thanks for the chance. Cersi a growing pit bull puppy ! She would love to have something so delicious to eat to help her grow ! Sadie, the Carolina dog, would love to try this food. She is such a picky eater. My puppy would LOVE to try this food. He’s a mutt from the shelter and suffers from a sensitive tummy. We feed him all natural ingredients. We would be thrilled to win this! Sounds like something my puppies would love to try! I like what I’ve read. My babies are very important to us. We want to be sure we are giving them the best food. Would love to win. Am looking forward to trying your food on my girls. We’re taking care of 2 dogs. Both 18mos old. Thy’re our childrens pets and being their both away for College & other one is Work related my husband & I are their caregivers. We love both of them. We would love to try giving them new healthy dog food. One of our dog is picky eater . We tried different brands too. Hope this one is the right dog food for him. My dog would LOVE to try this out! He is extremely active – mountain biking, hiking, and trail running. He loves himself some good raw or home cooked food. He loves to try new things out and would gobble this right up! I would love to try this food! What an interesting concept! I love the “blue apron-type” meals myself. I’m sure Baron would appreciate something more delicious than his normal dry food and occasional table scraps that we mix in with it! I am sure my dogs would love to try this. I have 4 boys 3 of them rescues, and I try to cook and bake for them when I can. It would be great to have a source for cooked food for them, especially with 4 of them they are all wanting attention so not having to cook would be great. I think Maddox would like this he just came from the shelter in bad shape and we are trying to put weight on him. Its a challenge to find healthy things he wants but we would love to give this a try for him. I would love to try The Farmer’s Dog! I have three rescues, and try to feed them right, however, one has terrible digestive issues, and they all have poor teeth or gums. It costs so much to feed my furry family, but I do my best. Spencer would love to try the Farmer’s dog food, I currently prepare food for my rescue GS.